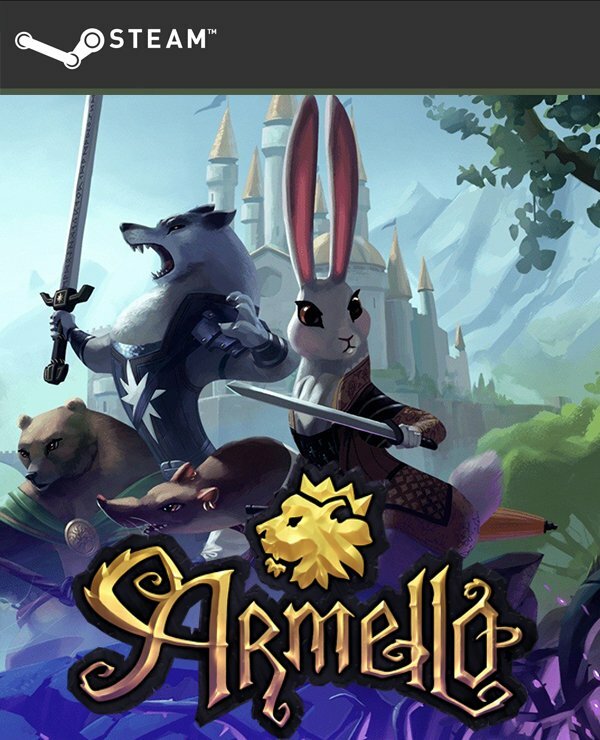 My favourite experience with Armello came from my first multiplayer match. After being unable to pursue my own quests and using an item that limited my movement speed, and therefore my manoeuvrability, I fell into bad spot after bad spot. I made do with what I had—I used a Banish card on myself to escape being surrounded by three other players, and my influence with the King to terrorize all the villages in the world, allowing me to capture some for extra much-needed Prestige. In the end, it came down to a mad scramble to fight the dying King, with two heroes killing each other and opening the way for me to enter and kill the king myself, thus taking the crown and the game. Random chance is important in board games. 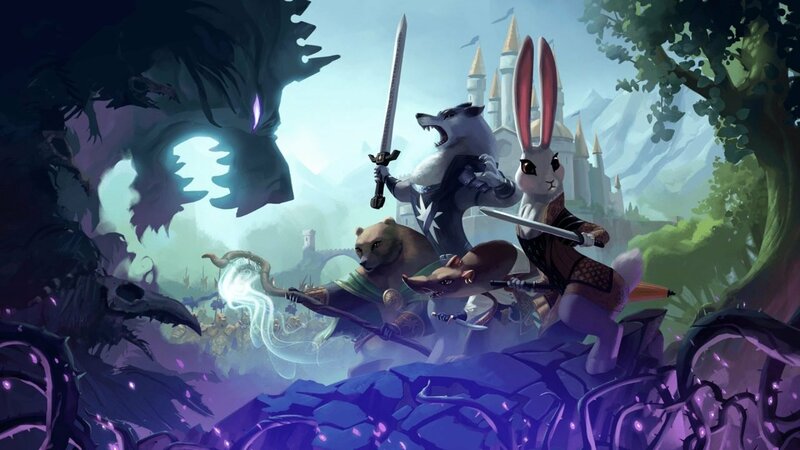 Even the complex “RPG” board games, which rely on a combination of dice, tokens, cards, and a slew of rules and permutations under a veneer of narrative rely heavily on these elements being random as part of their drive. Winning becomes not just a question of strategy, but of adapting to what the dice deal you (as opposed to video games, which often have reliable progression and fixed goals one can plan around). 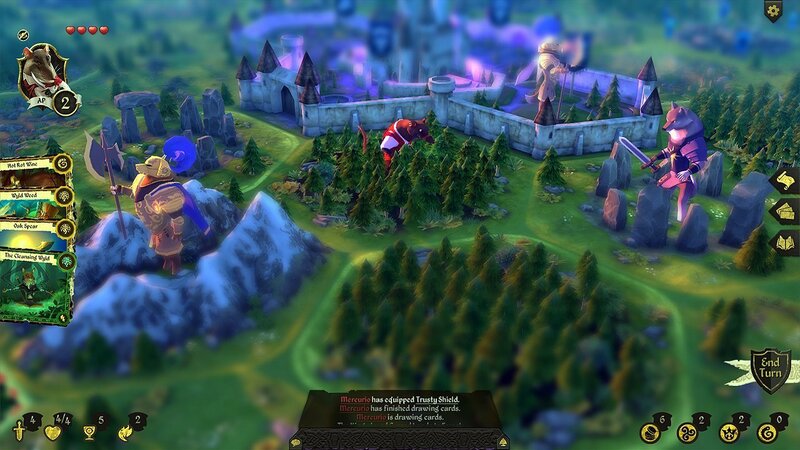 Armello handles this well, making repeated games of backstabbing, luck-cursing, and panicking enjoyable and fun. 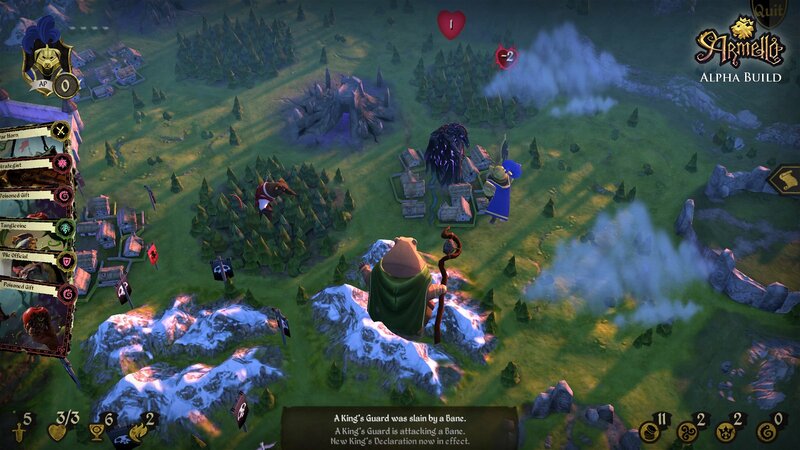 This Australian-made game’s goal is to replace the dying King of a land of fantasy animals, a hulking, maddened lion corrupted by a magical disease known as the Rot. As one of eight characters of four animal tribes, you march out to find some way to either depose the monstrous monarch, or become famous enough to be named his successor. I was a bit of a Redwall fan when the first book came out, so I appreciate the setting; especially its focus on nature magic and corruption. It seems to be a bit of a mixed bag—there are European elements, but the occasional flair of other cultures (I get a bit of a Japanese bent from Amber’s umbrella-concealed blade, for example). Everything’s bright and colourful; even the corrupted black-and-violets of dark rituals are distinct. The game looks amazing. The majority of the board and characters are three-dimensional, which aren’t immaculately detailed, but manage to distinctly match the character art present. Hexes show off sleepy towns that burn as they’re terrorized, filled with shrieks and crackles; dungeons, forests, stone circles, and mountains all dot the octagonal landscape. The game-cards have some of the best art, depicting scenes and abilities in partially-animated splendour—their artwork’s definitely eye-catching, ranging from a spear flying through the air, to a bloated pig of a noble (literally a pig) devouring everything while ignoring important correspondence, for a power that cripples a player’s ability to profit from their own lands. Fights between players result in a dice-rolling spar, which uses a Flash-like art style present in the game’s animated opening that I find most endearing. While there’s no voice-acting, a text scroll accompanies each of the four tutorial prologues, and the game’s opening. The soundtrack of haunting, fantastical tones and the screech of demonic Banes adds to the overall atmosphere. The matches themselves tend to, in good board game fashion, vary wildly in outcome and play. You have roughly nine day/night cycles before the king dies; plenty of time to backstab and dominate your way to victory, or defeat. Collecting gold or magic to make use of your various cards is key, but the most valuable resource is prestige, which allows you to dictate daily board-affecting occurrences through the King, as well as allowing you to win the game in any situation where he dies on his own (without another player being the one directly responsible). Resource management is critical, as having enough gold to heal all of your health or kill another player outright is important, as is placing “perils” (traps that require dice rolls to overcome) to control players. There’s tremendous strategy involved. Cards can have multiple uses and synergies, which can allow you to damage others, or they can be burned in conflicts to force your dice pool to produce certain results. This is nothing new for RPG board-games like this, but it is well-executed—the complexity and utility is important. The game gives you options—quests have safe methods to complete, as well as special options depending on your gear (a Coinmaster in your companions table, for example, might allow you to bribe your way out of certain quests). Even picking your character grants you different playstyles—my favoured character, the Wolf Clan’s River, had a bow that did a point of damage to enemies before she attacked. Each clan’s available bonuses and a slew of generic tokens let you customize stats prior to the game. There’s a lot of potential in this to sit around with three other random people, even though the emote system is a bit limited (no way to directly congratulate players, for example). Still, it’s a quite fun online board game. I highly recommend it.